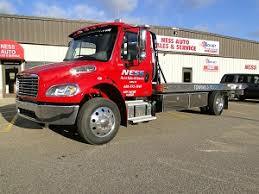 If your looking for towing Poynette WI you don’t have to look any further than Ness Auto Sales and Service in Lodi. We offer up to date towing equipment and great staff to help you with your towing needs. Don’t call just anyone when your vehicle is disabled. The wrong person could cause more damage to your vehicle than you already have. Whether it’s a tow truck or a flatbed we have the equipment to help you out of a problematic situation. Look for a professional for towing Poynette WI; the wrong towing company could cost you money. There’s more to a towing service than just having a tow truck or flatbed. Those people inside the vehicle are as important as the towing equipment they’re operating. When it comes to towing Poynette WI we can assure you that at Ness Auto Sales and Service you’ll find are professional, reputable and courteous staff that will take the tension out of your situation. If you need quality towing Poynette WI look no further than Ness Auto Sales and Service in Lodi.